Milky Way rises by the East. 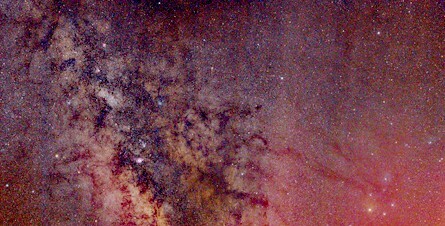 Sagittarius on the left and Scorpius on the right. 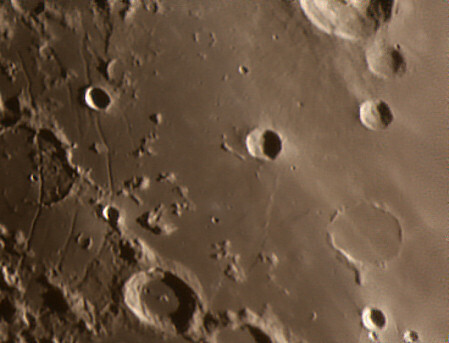 Near Bullialdus crater (at top-right side of the picture) there is a quite interesting region called Rimae Hippalus. 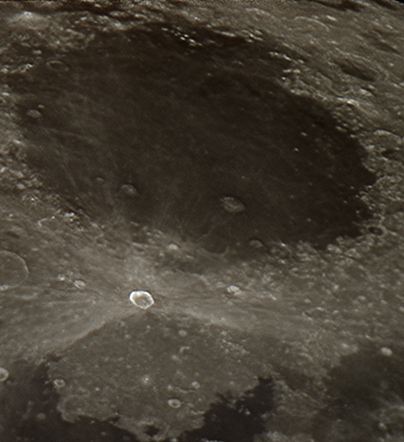 Hippalus crater is the big one (left-center side of the picture). It is a big crater. In this image, shadows in this crater due to a low altitude sunlight creates a visual effect, as if a great creature had stamped his bare footprint in lunar soil. Do you see it? Summer views of Milky Way are spectacular because the galaxy bulge is brighter and broader than its spiral arms visible the rest of the year. Located near Sagittarius and Scorpius constellations, the bright nebulae and dark lanes of the area creates a beautiful contrast in brightness and colors. This picture is a 4-pane mosaic ensambled with free software Fitswork 4.40. Every pane is a 10 minutes exposition through a 55mm lens attached to a Canon EOS 450d (Rebel XSi) DSLR camera, mounted over a motorized equatorial mount, Sky Watcher EQ6. Aristarchus is a large impact crater on the Moon, is in the northwest of the nearside of the Moon. It is considered the brightest of the large formations on the lunar surface, its albedo is nearly double that of most other geographical spots. The crater is bright enough to be visible to the naked eye and is stunning when viewed through a large telescope. It is also easy to identify when most of the lunar surface is illuminated by reflection of light on Earth. 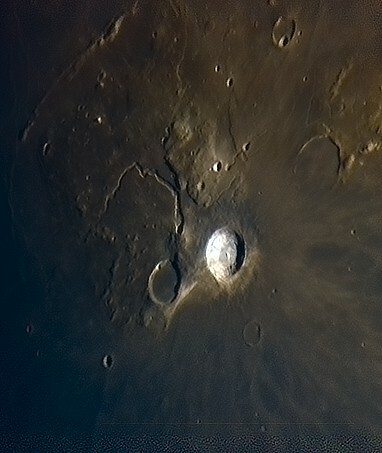 The crater is located on the southeast edge of the Aristarchus Plateau, an area that contains several high volcanic features, such as wrinkling rimes. This area is known for it have been detected in a significant number of transient lunar phenomena of nature as well as by recent emissions gas radon to be measured by the spacecraft Lunar Prospector. I took a bunch of 30 seconds shots aiming M42 nebula as regular, in order to stack them later. Polar alignment was also regular, using EQ6 polar scope, probably not perfect. I think M42 is a good target to measure periodic error in RA movement due to its near 0 degrees declination. In order to show the drift, I stacked the shots without drift correction using a free software called startrails that gets the brightest pixels per shot, obtaining that way the best startrail you can achieve. To measure the length of the drift, I requested a single shot solved plate from astrometry.net. They provide an exact width in arcminutes of the field. 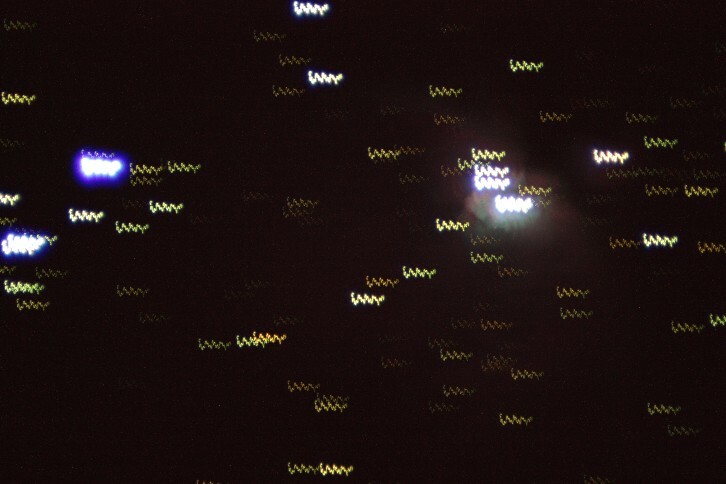 Then, I divide the width field by the width in pixels of my DSLR camera sensor, obtaining the resolution per pixel in arcseconds (a number close to 1 arcsecond/pixel for a 1,200 mm effective focal length telescope). Then I measure the height of RA drift pattern with my regular post-processing free software, Fitswork4, and multiply that value by the previous resolution. That is the way I have found that my EQ6 mount drifts around 40 arcseconds in RA movement. Dividing total exposure by the number of cycles (top peak to lower peak) I got the elapsed time needed to fulfill the periodic error: around 6 minutes long.